Believed to be lost for roughly half a century before being rediscovered in 1970, Cecil B. DeMille's 1915 silent melodrama The Captive comes to Blu-ray in a pleasingly crisp new scan. The film stars Blanche Sweet and House Peters, who had worked with DeMille a few short months earlier, in a Civil War-set star-crossed romance called The Warrens of Virginia. Based only on the bare-bones synopsis that exists of Warrens online, The Captive appears to be an instant remake, but with the locale switched to Montenegro during the Balkan Wars. Blanche Sweet plays Sonya, a poor Montenegrin peasant whose breadwinner brother goes off to fight in the war and dies in battle. House Peters is Mahmud Hassan, a Turkish nobleman who is captured in battle and forced to work on Sonya's farm as a prisoner of war. Despite its wartime setting, The Captive is actually pretty lighthearted during its first two-thirds. There are quite a few fish-out-of-water moments, in which sheltered Mahmud has to be shown how to perform manual labor. There is also a subplot about a brassy neighbor, who prefers handsome Mahmud to the swarthy prisoner she was assigned, so she continually hits on him. Mahmud politely declines, because he is an honorable sort. (He would have to be, because, even with the gun and whip Sonya carries, Mahmud could easily overpower his captor and run away, if he really wanted to.) Instead, Mahmud prefers palling around with Sonya's kid brother Milo (Gerald Ward), which inevitably endears Mahmud to Sonya. 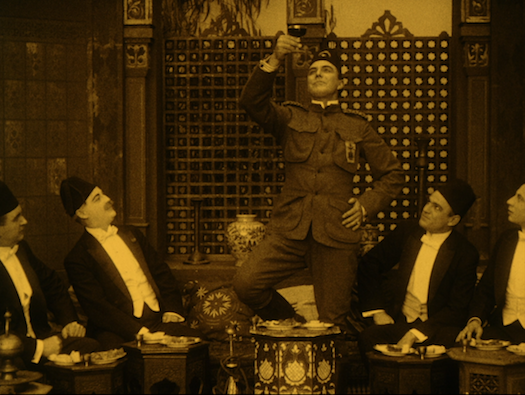 The war comes home in the film's final act, as Turkish troops seize Sonya's village, and Mahmud is forced to decide whether he wants to rejoin his army comrades or defend Sonya against the brutish soldiers. This is a romance, so his choice is pretty much a foregone conclusion. Considering his light touch for most of the film, DeMille shows surprising toughness in staging the late-film violence, including a sequence where Mahmud, Sonya, and Milo barricade themselves into their humble country house while a few dozen soldiers try to bust in and slaughter them. The story (by DeMille and his favored screenwriter Jeanie Macpherson) is a little too pat and predictable for the film to rank with DeMille's best-known work of this period. Heck, DeMille made two other films just within the span of 1915 -- The Cheat and Carmen -- that are more memorable. That said, a film doesn't have to be a masterpiece to be worth watching. There's no denying the entertainment value and high level of craftsmanship in The Captive, which should be more than enough reason for curious film buffs to give it a shot. The upside of Olive offering The Captive with no bonus features is that there is plenty of room on the disc for the 50-minute feature. Supported by an extremely high bit-rate, this AVC-encoded 1080p 1.33:1 transfer boasts excellent clarity, with extremely well-resolved film grain. There are some source issues with dirt and scratches, plus a few sporadic contrast and image density anomalies, but, for the most part, this is a strikingly stable presentation for an obscure, century-old movie. Composer Lucy Duke provides a new musical score, that is effective, stays in sync dramatically with the film, and avoids getting too gimmicky. It is presented in a nicely fleshed-out DTS-HD MA 2.0 stereo audio mix. It's satisfying to see an old forgotten silent like The Captive make the transition to the Blu-ray format, looking as good as it does. It's not an unsung masterpiece, but the storytelling is solid and the actors are quite appealing. Even with the bare-bones Blu-ray, this one comes Highly Recommended for silent film fans.